Discussion in 'Article Discussion' started by Combatus, 31 Jul 2015. Typo? "Submissions need to be made in this forum thread in a single post - before midnight on July 17th" in The key info. Unless someone has invented time travel already and not told me about it? Any chance of changing to a non fixed-width layout? 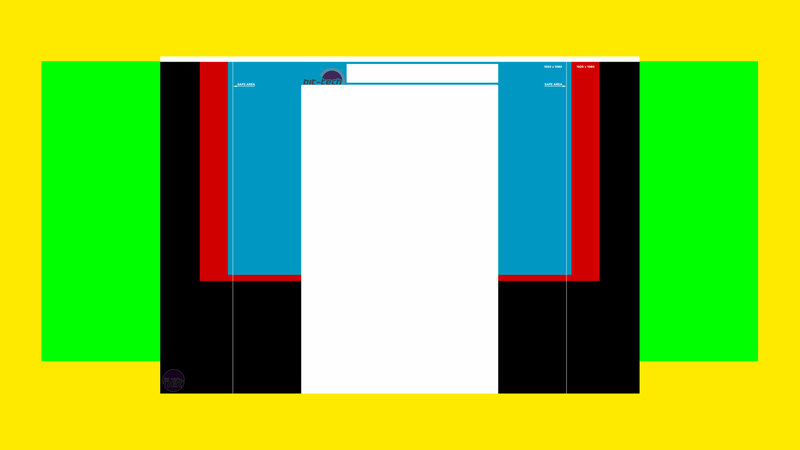 updated the layout image with 3440x1440 (green) and UHD (yellow) to illustrate the problem. Is there a reason why each person can only submit one (pair of) skin(s)? I mean, isn't the more the better in this case? Sorry - had intended to publish this earlier this month! The deadline is still 16th August and submissions are via email, but feel free to post your early designs and discuss anything else in this thread. If you want to submit more than one design feel free, but we'll only be entering one design from you for bit-tech and/or bit-gamer to the community vote. So if you have a couple, we'll relent and accept whatever you send, but we'll pick our favourite to go into the voting stage - just to keep things fair. Can you please enlarge the main content are of the site? 1920 wide at the very least (1080p is the most popular resolution by far), or even do a mildly dynamic site that scales for 2560 wide screens? Right now it looks like this on my 2560x1600 screen, which is frankly, comically tiny. Also, can we have a dark theme too (for both the main site and the forums)? Too much crap is bright white, despite having no reason to be (since there isn't a huge amount to be spent on ink). That's just a setting in the User Control Panel, at the bottom of the "Edit Options" page (change Forum Width from "Fixed" to "Variable"). Sadly the front page does not appear to have a similar setting. This too. It'd be nice if the new site worked well on tablets and mobile phones. Yes you can double tap to zoom into content on the current site, but a responsive design is just that bit nicer. Can breaking news items be announced by Miley Cyrus swinging across the screen on a wrecking ball? That would be cool. 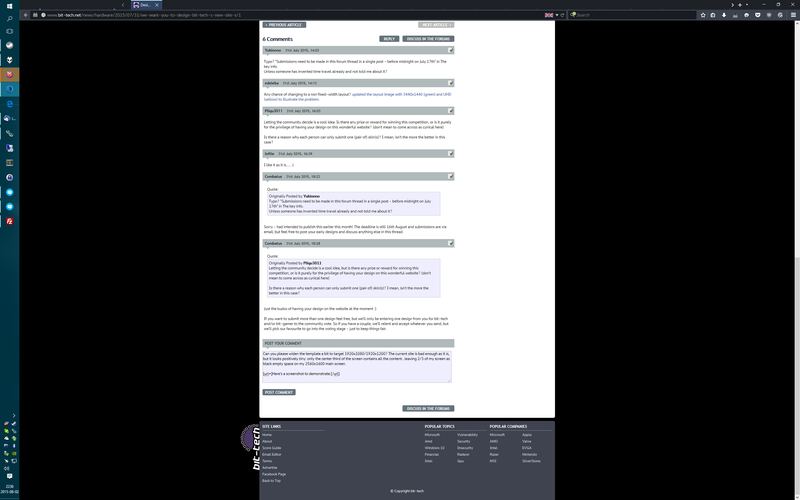 When I'm not working, I'll have my browser opened maximized on my 2560x1600 screen for some very immersive browsing, since I have my IM windows on my left 1920x1200 screen and IRC on my right 1920x1200 screen. When I'm working, I'll have many more windows tiles, but when I'm working I'm not really browsing the internet and reading bit-tech, am I? Could you share a couple of screenshots of your full-screen browsing? I'm genuinely curious to see how it works; I just tried the BBC News site at 1920-wide, and it takes up less than half the screen - of which about three-quarters is the content - with massive white bars down the side. I can only imagine how ridiculous it looks at 2560 wide - unless you're at a very high zoom level? Are there sites that work particularly well at such widths? This sort of contest really worries me. As a design and long time Bit-Tech visitor, I had hoped not to see something like this. I'm a designer and developer, and have seen lots of design contest like this crop up over the years. They are what is referred to as speculative work. What this means is work is done with only the hope of reward for the individual. This is bad for the business and the individuals doing the design work. For the individual, they are putting their time and effort into something they are unlikely to get rewarded for. For the company, they are getting something for free, but without the process designers normally go through: getting to know the business, understand the aims of the company, understand the limitations of the project. The whole point of this is a collaborative effort. Obviously, some people would love to do this, and I don't want to spoil it for people, but given what I have seen with these kinds of contests going south quickly, I feel I have to speak out. Pliqu3011 and Teelzebub like this. Exactamundo! Full screen browsing seems a waste of space. It's just a background for the website. What's the worst that can happen?